After wrapping up my scholarship year in New York in April I returned to Panama to explore Coiba National Park, a marine reserve on the Pacific coast. I had heard during my previous visit to Panama that the diving there was amazing and there was a good chance of finding sharks in the waters surrounding the park. Rumours of Hammerheads, Bull sharks and even Tigers had inspired me to explore further and the goal of the trip was to evaluate its potential as a place to start my shark conservation project. I planned to deploy underwater cameras and investigate as many dive sites around the park as possible to see what I could find. Coiba is the largest island in Central America and is an unparalleled destination for discovering new species and offers some of the best diving in the Western Hemisphere. From 1919 until 2004 the island was home to Panamas most notorious prison and was used exclusively for that purpose (very similar to Alcatraz in the USA!). To this day the island is still totally uninhabited except for the rangers that manage the park and this lack of visitors has kept the environment in pristine condition. This led to the entire area being declared a UNESCO World Heritage Site in 2005. The waters surrounding the island of Coiba are filled with many fish and marine animals and by one of the largest coral reefs in the Pacific of the Americas. Some 760 species of fish have been recorded here, including 33 species of sharks, snappers, barracuda, amberjack, and marlin. Sadly the authorities are struggling to protect this marine life. A lack of resources means that it is impossible for the rangers who live on the island to really make a difference. I witnessed first hand the struggles these men face trying to patrol and protect such a huge area. Although they are all passionate about the conservation and management of the island and its fauna, their efforts alone are not enough to repel the assault of the illegal fishermen. Every day many boats enter the park to exploit its waters. Most of these fishermen come from villages close by but do not consider the impact they have on their own environment. As fish stocks decrease most of them struggle to even earn the minimum wage. On a more positive note marine tourism is increasing in the region. In 2013 eight thousand people visited the island for recreational purposes and in 2014 numbers increased to ten thousand. Although the demand to visit the park is increasing, the number of local operators has remained more or less the same, mainly due to a lack of education and understanding of the tourism industry. I discussed this personally with many fishing boats that visited the park during my stay. Mario a fishermen from Puerto Mutis, told me that he would love to start sharing his knowledge of the ocean and its resources with tourists and make more money by consequence but has no idea where to start. He doesn’t know how to attract potential costumers, doesn’t speak English and has no idea how a business like that would operate. Telling Mario the fishermen the size of the fish we need…! The obvious solution is training, and this has happened in the past. 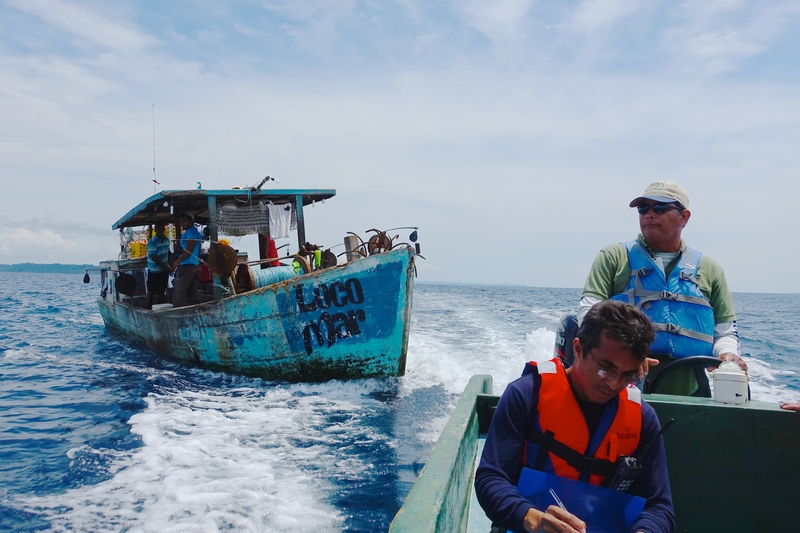 MarViva Foundation taught a group of fishermen the benefits of ecotourism and how to be guides for a Responsible Cetacean Watching program. I met Jorge Espinoza, one of this group and he helped me a lot in our exploration. 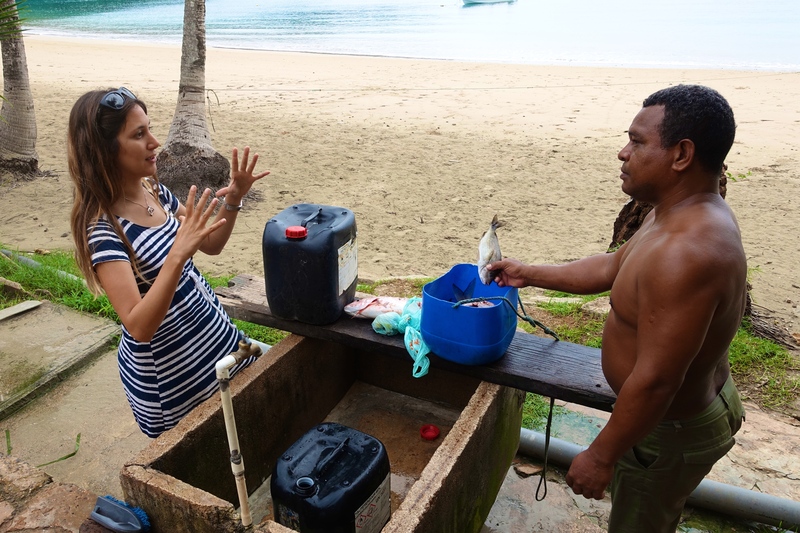 I was impressed to see him running a successful guided snorkelling company in Coiba. For me he is a role model to follow and an example of what I would love to achieve with other locals!!! This is one of the key goals of my project. To provide an alternative income for local communities by involving them directly in shark ecotourism. To do this though we of course need the sharks!Sadly after much anticipation and exploration the big shark species I was hoping to find did not materialise. Although we put BRUV cameras down in many locations, the only species we encountered during our stay were White tip reef sharks and a solitary Nurse shark. After interviewing local dive operators, fishermen, rangers and even tourists I am certain that there are bigger sharks in the area but we just did not find any this time. There could be many reasons for this such as: a) Extremely high water temperatures during our research due to El Niño (between 30/31 degrees! ), b) many sharks follow annual migrations and maybe we were just here at the wrong time of year, c) fishing has depleted the number of apex predators in the area… and d) not enough cameras, locations and data recorded. The only one of these variables we had any control over was increasing the duration of the research and the amount of information recorded but unfortunately I was limited to only one boat and camera system. Sometimes we would also struggle to get bait to attract the sharks making things even more difficult. Ironically I ended up depending on the fishermen I hope to convert to the tourism industry in the future! Although the results of my shark research in Coiba were disappointing I still witnessed an abundance of wildlife during my stay. I was amazed by the high biodiversity both on land and in the water! 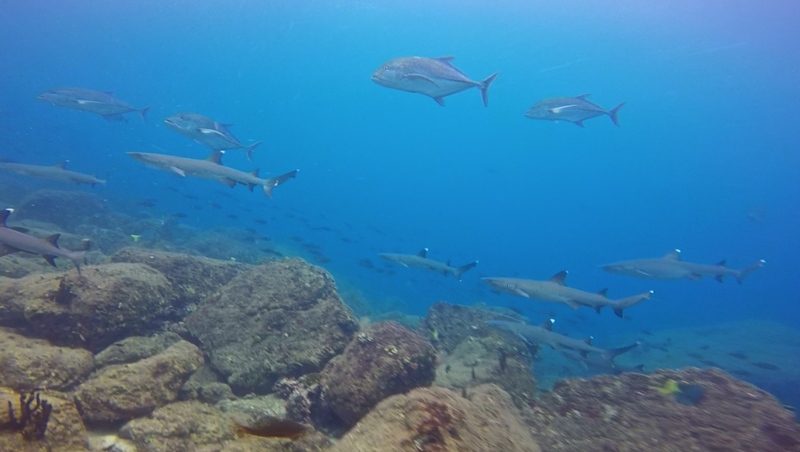 It was wonderful to see an ocean so full of fish and a couple of times we even encountered huge Jacks and White tip reef sharks hunting together which was something I had never seen before! Tiny marine life like seahorses and frog fish were also delightful to observe and photograph. By far the most impressive animal found on land in Coiba is long term resident Tito the crocodile. For years Tito has been visiting the ranger station after being introduced to the park many years ago by Mali-Mali (the most famous park ranger who was an island prisoner! Please read his amazing story here!!!). It was crazy to live so close to such a huge and potentially dangerous creature and I spent many hours watching and photographing him. Also encounter with monkeys, iguanas, ñeques (like a small capybara) and many types of crustaceans and birds were part of the daily routine. It was an amazing experience being able to stay in such a remote and pristine environment surrounded by nature, although living in paradise did provide other challenges. Mosquitos and sandflies were a constant irritation and getting supplies to the island from Santa Catalina was difficult at times. Also I was forced to disconnect from the world for a while as both cellphone service and internet were non-existent. This of course is more of a positive than a negative but I did miss keeping in touch with family and friends (and ok Facebook!). I received help from many people during my stay. The time I spent in the park was possible thanks to the National Authority for the Environment (Autoridad Nacional del Ambiente, ANAM). In exchange for their hospitality I discussed shark conservation with many visitors to the park and even did some presentations to the local schools and visiting university groups. I am also putting together a video about the island which will be used to welcome tourists in the future. I am working on that now so watch this space! 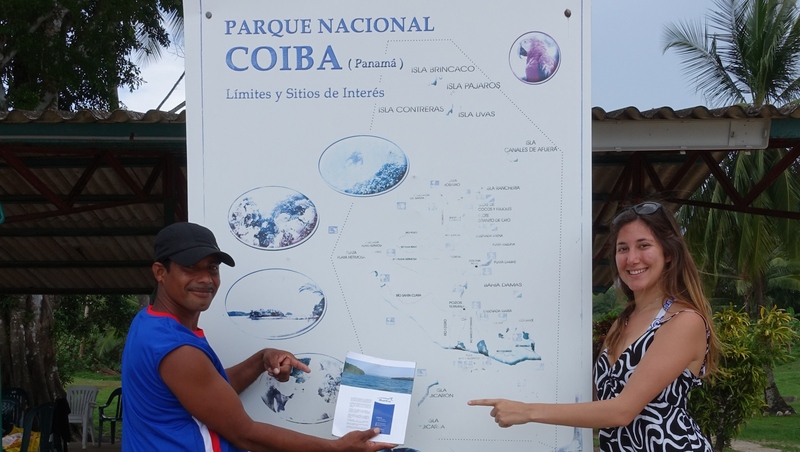 Also a big thank you to the hard working and dedicated Park Rangers of Coiba, to Panama Dive Center (the best operator by far in Santa Catalina!!! ), to Jorge Espinoza and son and to the rest of those who helped make my adventure exciting, interesting and educational. I hope to one day continue my search for sharks in Coiba with more resources. Until then I will continue to travel and learn about sharks and ecotourism from the many contacts and friends I made during my scholarship year. Next stop Fiji and the big Bull sharks of Beqa Adventure Divers! Where I will learn more about Shark Conservation from the best in the business.